It seems that China has made yet another move to become the biggest in the world, of something else. The mass production ability of this rising technology star has added the official title of being the world's largest solar power market. 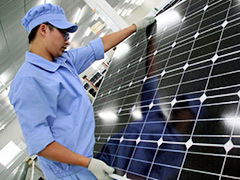 As of 2013, the China solar power market will be producing three times the solar capabilities that they did in 2012. The giant entered the market with a bang and with inexpensive production has literally pushed many companies to the point of going out of business. The lack of ability to compete has had an upside for the consumer as prices have been reduced by about twenty percent. The China solar power topic makes another turn as they are not only the largest producer but also the largest buyer of solar power in the world; and has replaced Germany in the top seat for production. The expectation of the Chinese government is to have 10 gigawatts of new solar power this year (2013). That is actually double what their previous target was and three times the 2012 expansion. By the year 2015 they will be installing 35 gigawatts as compared to the former goal of 21 gigawatts. In summary, China solar power is growing at 300 times per year. There is a dichotomy to this story, as China may appear to be a forward thinking mega country when it comes to the topic of solar, but you also need to keep in consideration that they are the largest emitter of carbon dioxide. The goal of the country for their own internal uses is to expand and diversify their current coal dependency. The plans for the old coal production haven't been shared, but advice has been given that China needs to close those plants and not build any new ones. In previous global meetings, China refused to participate in worldwide environmental clean up efforts stating that they didn't feel they needed to be responsible for pollution that their country didn't create. All the while, they edged further and further up the statistics ladder for pollution while other countries decreased. However, it seems their attitude about a green planet may have changed when it came to the bottom line dollar. The financial outlook for producing and even using solar power created a topic that they could relate to: using their industrial capabilities combined with their huge factory workforce for profit. This is another dichotomy discussion as that seems to go in the opposite direction of a typical Communist regime; but, they are a country of complicated concepts. So the outcome appears to be one that is showing that any new purchase of solar power products will be the same as buying almost anything else in our country: it will be stamped with the “Made In China” label and Americans as well as customers around the world will be enticed by the lowered prices and easy access. So is this good for the planet? I guess it depends on your perspective. Posted on May 6th under Energy of Stars. I don’t think anyone is surprised at this one. China has been battling an overgrowth in population combined with the inner turmoil of being unsure what their identity is. They have to keep up with their explosion of power needs, since they are dominating the scene in manufacturing. The only question now is, can they do it. Doesn’t matter what your opinion is, this is not good news for America. Thank heavens Obama is making an effort for the country to start making our own power as well as being a leader in saving the planet. It’s about time, because we are doomed if we don’t. This just means the U.S. has to be more focus on renewable and sustainable energy sources. Otherwise, we will be trading in our oil dependency for solar dependency on other nations. We already gave up our lead as a world manufacturer, don’t want to see us slip even further. You gotta give em credit. It was only a short time ago that they were a cloistered Communist country with little interest in the outside world. Seems like they have been taking the lead on a lot of things and now it’s solar power.